HIPAA privacy compliance requires under the oral communications section that healthcare providers must take reasonable measures to insure that health information remains private. To be HIPAA privacy compliant you need to take precautions to make sure that medical information being shared from doctor to patient not be overheard. Healthcare providers must make reasonable precautionary steps to insure that medical information remains private. As required by HIPAA privacy compliance codes this covers health care providers, doctors offices, employees, vendors, service organizations, universities and healthcare plans. Many precautionary measures can be taken to make sure that your office is HIPAA compliant. Acoustical door seal kits can be added to existing doors to cut down the amount of sound that gets transferred to adjacent offices and hallways. 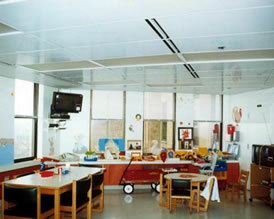 Signature noise barrier ceiling tiles can be used to reduce the amount of speech being transferred from office to office. Acoustical fabric wrapped wall panels can be added to help reduce the amount of ambient noise in the office while maintaining an aesthetically pleasing environment.